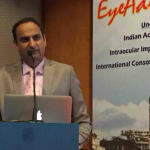 Dr. Tejas D. Shah is a respected Eye Surgeon and Ophthalmologist who currently stays in Ambawadi in Ahmedabad, Gujarat. With 29 years of successful work experience he holds numerous successful eye surgeries in his records. He received the MBBS degree in the Smt. NHL Municipal Medical College, Ahmedabad in 1987 and his Diploma and MS in Ophthalmology from the Smt. NHL Municipal Medical College, Ahmedabad in 1991. In 1992 he joined the Amdavad Eye Laser Hospitals Pvt. Ltd as an Ophthalmologist and is presently its director. He has received the Fellowship in Cataract Management and completed the coursework under Dr. A. R. Vasavada and a Fellowship in Corneal Diseases from L.V. Prasad Eye Institute. He is mainly trained in cataract and refractive procedures (a procedure aimed to give independence to the patients of all ages) and is striving hard to make people see without the help of glasses. He is the first surgeon in Gujarat to perform operations like Keratoplasty (a procedure where the abnormal corneal tissues are replaced by the cornea of a healthy donor), implant of a natural Restor IOL (implanting a lens in the eye to treat cataract and myopia), performs PRK (a refractive surgery to check myopia, astigmatism and hyperopia) and Verisyse IOL (fitting a micro lens behind the cornea). He is one of the 10 certified Restor IOL Users in the country. He has pioneered the idea of group practice in India. He also gives regular eye care tips to thousands of patients. It was getting very difficult for me to cope up with my eye infection. I am almost my normal self post the treatment and for that Dr Tejas D. Shah is the reason. Even in case of long queues, the staff was managing people in a very positive manner. One of my neighbour's recommended Dr Tejas D. Shah. I am really grateful as his eye infection treatment has give me a ray of hope. He is very patient with all his patients. I am so much benefitted with his eye infection treatment, that i am perfectly fine now. The doctor doesn't just randomly prescribes medicines, but first properly diagnoses the problem. I feel strange that I am suffering from weak eyes My previous experiences were not so good, but Tejas D. Shah has completely changed my opinion as he is very helpful and humble. It's been more than a year that I was experiencing weak eyes. A friend of mine referred to Tejas D. Shah. The overall atmosphere in the Amdavad Eye Laser Hospital is very soothing. The lab in the Amdavad Eye Laser Hospital was very clean and well managed. I owe him him a big thanks for making me fine again. On the very first day he identified my problem. I was amazed that other doctors before him were not able to even diagnose my problem, but Tejas D. Shah did it immediately and started the lasik surgery for it. It was an amazing experience as everyone in the Amdavad Eye Laser Hospital is so nice. Never once that I felt that he is getting impatient, rather he has always responded to my each and every doubt with immense patience. Even though Dr Shah is not from our city, he is still very famous, so we consulted him. I was having very bad thoughts regarding my conjunctivitis. I thank the Amdavad Eye Laser Hospitall was so nicely made. I am so happy that I chose Dr Tejas for my conjunctivitis treatment as now I am perfectly fine. The friendliness of staff is the best in the Amdavad Eye Laser Hospital. I remember, I read an article of Tejas D. Shah in the paper and made contact. Tejas certainly knows the in and out of herspeciality. I am amazed that Dr Tejas D Shah is such a sweet doctor, even though he is so busy all the time. Dr Tejas D. Shah has in depth knowledge and ensures that he explains the problem in detail. I was shocked to experience eye discharge because suddenly it happened. But the doctor helped me in the treatment. He found out the root cause and treated it successfully. I am glad that I consulted him for the treatment. I had an itching in my eyes for which I was very bothered. I consulted Dr Tejas. He is a well known ophthamologist in Gujarat. He gave some tips to keep my eyes healthy which benefitted me to great extent. The best thing I found in him is that he prescribed limited number of medicines. I thank him for providing the best possible treatment. Never thought I will suffer from something squint like this. Dr Tejas's treatment suited me the best and now I am fine. No matter how critical be the situation, he is always very calm. He is well aware about innovative techniques to treat problems. The atmosphere in the Amdavad Eye Hospital is always so positive and full of life. It has been quite some time that i was suffering from wateryeyes. I was shocked to experience the symptoms of wateryeyesEven though there was a long queue, still the staff was very pleasant. He ensures that he gives enough time to each patient. Tejas D. Shah has expert knowledge in the field. discipline & nice treatment to all doctor , supporting staff for hospital.you suggest to me for every surgery & treatment.thank u for all hospital member. Sir's advice was a great help and very informative. LASIK: How LASIK Eye Surgery Works? LASIK or laser in situ keratomileusis, is a form of corrective surgery that help patients who are suffering from near sightedness (Myopia), far sightedness (Hypermetropia) and even astigmatism (cylindrical power in glasses). This procedure aims at correcting the shape of the cornea, which is the transparent layer that lines the front of the eye. Through this procedure, the cornea is reshaped so that the retina receives a focused light. Quick (total duration of surgery is hardly 5 minutes) and virtually painless. Has a high success rate ( success rate is 96%). Does not require bandages or stitches. Adjustments can be made years later to alter the vision as per growing impairment in the future and advancing years. Minor side effects like dryness, glare and halos, if appear, subside with time. Note: One should abstain from wearing contact lens at least 2 weeks before the procedure. Patient is likely to have some inflammation after the procedure and temporary dryness. Crying: How It Affects Your Body And Mind? Do you know that every little activity that you perform on a daily basis impacts your body? What you eat, how long you sleep and even every tear you shed affects your body. Most people are aware of how their body reacts to major activities, like exercising, but few are aware of how the body reacts when they cry. While you are generally concerned with the mental cause and effect of crying, have you thought about what crying does to you physically? Tears are not always shed when a person is upset. Tears are a body's way of expressing itself as well as protecting itself. Everything from a happy ending in a movie to a dust particle in the eye can make you tear up. There are essentially three kinds of tears. Basal tears and reflective tears help keep the eyes lubricated and irritant free respectively. It is the psych tears, which we commonly refer to as crying, that come as emotional responses. When you cry, your tears help your eyes remain clear. It also has anti-bacterial properties that keep your eyes clean. Your eyes remain properly hydrated thus reducing any kind of irritation. You might feel dehydrated after a while due to the loss of water and salt. Even the excess manganese in your body gets washed out through tears. But for some, the act of crying can cause medical complications. It can lead to fits or can cause an acute shortness of breath. For those with severe heart conditions, there can be a cardiac pain. Crying can take a toll on your body if you have certain medical conditions. For most people crying does more good for their body than harm. 4 Tips For Better Vision! An important organ of the body, eyes must never be taken for granted and need to be protected at all times. In addition to protecting them, you also need to improve as well as maintain their overall health. To have healthy eyes and consequently good vision, you need to have foods that keep them in good health. Nutrients like Zinc, Vitamins C and E and Omega-3 fatty acids can help to fend off age-related sight problems such as cataracts or macular degeneration (a condition characterized by the deterioration of the middle portion of the retina). Foods like eggs, nuts, green leafy vegetables, oranges and citrus fruits are what you need to have to get good eye health. Smoking can adversely affect your eye health and can make you prone to eye conditions like cataracts, macular degeneration and damage of optic nerve (a nerve that transmits impulses from the eyes to the brain). By kicking this habit, you end up saving your eyes from irreversible damage. Exposure to the sun’s ultraviolet rays for a long period of time can make you prone to common eye problems including cataracts. To protect them from the sun’s harmful rays, you need to use sunglasses that block 99-100% of ultraviolet A (UVA) and ultraviolet B (UVB) rays. Going for regular eye examinations can help in protecting your vision and ensure you see clearly. Eye examinations are important to help you find eye problems like glaucoma (a condition wherein the optic nerve is damaged, resulting in vision loss). A comprehensive eye examination can help in identifying problems like nearsightedness, farsightedness or astigmatism (an eye defect that occurs to a deviated spherical curvature). If you wish to discuss about any specific problem, you can consult an Ophthalmologist. Good eyesight can be an outcome of a diet rich in Omega 3 fatty acids and vitamin C. Including certain foods in your diet can be directly beneficial for your eye health and can improve your vision. Here is a list of 5 foods which will help you combat age-related vision problems and will supplement your overall eye health. 1. Eggs - Eggs are rich in vitamin A and lutein, which help you combat age-related vision problems and night blindness. Eggs are also beneficial for dry eyes and improving your eye health. Egg yolks are considered to be one of the best foods for your eyes and should be included in your regular diet. It also helps prevent age-related macular degeneration (AMD), which is one of the primary causes of blindness in the 60+ age group. 2. Leafy Greens - Leafy green vegetables like spinach and kale are rich in lutein and zeaxanthin which reduce the chance of cataracts. It is best to consume them raw as they have more antioxidants when uncooked. Other green vegetables like broccoli, collard greens, and zucchini are rich in lutein and play an important part in preventing age-related vision problems. 3. Carrots - Carrots improve your overall eye health as it contains vitamin A, the lack of which is one of the leading causes of loss of vision. The orange hue in carrots is due to Beta-carotene which helps the retina function better. Other foods rich in beta carotene are apricots, mangoes, pumpkin and cantaloupe which also contribute to healthy eyes. So make sure you include them in your diet. 4. Almonds - Almonds are rich in vitamin E, which prevents macular degeneration. Include a handful in your daily diet as it not only improves your eyesight but also effectively lowers cholesterol and prevents heart diseases. Nuts like pistachios and walnuts contain omega 3 fatty acids which contribute to the maintenance of your vision. 5. Citrus Fruits and Berries - Citrus fruits like oranges, grapefruits and lemons are rich vitamin C which reduces the risk macular degeneration and cataracts. Blueberries also aid in the protection of the retina from damage caused due to sunlight and oxygen. If you wish to discuss about any specific problem, you can consult an Ophthalmologist. Your eyes are one of the most important parts of your body. They are delicate and essential. But, there are instances of it getting injured. Corneal abrasion or scratched eye is one of the most common injuries related to the eye. It causes discomfort to the eyes. It also leads to reddening of the eye and makes it hypersensitive to light. Corneal abrasions are caused due to loss of corneal cell in the upper region of the cornea. The top or upper layer is known as corneal epithelium. Cornea is the front part of the eye. It’s task is to help in focusing of light and enables us to see objects. A good and healthy cornea is needed and a must for having good eyesight. Thus, it is always advisable to visit an ophthalmologist immediately after you notice a corneal abrasion or meet with an accident that has led to corneal injury. What Are The Factor That Causes Corneal Abrasions? There are a number of ways that can result in corneal abrasion. It should be kept in mind that anything that comes in direct contact with the eye can lead to corneal injury. It is a painful scratch on the clear part of the eye or cornea.countless ways to get a corneal abrasion. Objects ranging from tree branches, paper, make up tools, finger, pet, debris in the workplace to sports toll, anything can cause an injury to the eye. Most of the corneal abrasions are n’t caused due to traumatic incidents that are noticeable. Your cornea might get affected by sand, dust and any other tiny object. The chance of corneal abrasion increases with dry eyes. The problem gets worse at the time of waking up from sleep. If your eyes are dry, it will get hurt as the lids can tear and dislodge a part of the cornea. It is a myth that contact lenses protect your eyes. They can also be the cause behind corneal abrasion. It is important to know that the cornea is one of the most sensitive parts of our body. Any injury in the cornea can be really painful. Other symptoms may include redness, tearing, headache, blurry vision, etc. The treatment depends upon the severity of the injury. Minor injuries can be cured with the help of non-preserved lubricating drops. It fastens the natural healing process. These are also treated with the use of antibiotic drops. The healing may take some two to three days times. Treatment for a corneal abrasion depends on the severity of the wound and the cause. Minor abrasions sometimes can be treated with non-preserved lubricating drops to keep your eye moist and comfortable while your eye's natural healing process takes place. In critical cases, an antibiotic ointment might be asked to use for a longer period. If you wish to discuss about any specific problem, you can consult an Ophthalmologist. All About Diabetic Macular Oedema! The diabetic eye is considered to be the leading cause of the blindness among the working age. It is usually caused by the change in the blood vessels on the retina of the eye. Retina is that layer of the eye which is light sensitive. In case of diabetic macular oedema, the blood vessels cause the fluid to leak into the retina. The loss of vision only occurs when the fluid reaches the macula. Macula is the center of the retina which is responsible for a sharp vision. When the fluid reaches the macula it builds up and causes inflammation. Initially this is not noticed but with time the diabetic macular oedema causes a change in the vision making it more blurred. A healthy macula is very essential for a good vision. The risk of diabetic macula oedema can be reduced by quitting smoking, and to make sure that blood sugar and cholesterol levels are under control. This is achieved by regularly measuring the cholesterol and blood sugar levels. Diabetic macular oedema can be detected during regular visits to the doctor. Patients with diabetes should be offered screening tests. Digital photographs of the patients can be taken as they show the early signs of diabetic macular oedema, though changes in vision might not be noticed at this time. Dilated eye examination: In this the drops are placed in the eye to dilate the pupils and then the back of the eye is examined. Fluorescein angiography: This is a diagnostic test in which an injection of fluorescein dye is given in the hand and then the photographs are taken. If you wish to discuss any specific problem, you can consult an ophthalmologist. Presbyopia - How Farsightedness Affects Your Vision? As we age we get wiser for our experiences and knowledge, but it is also an accepted fact that our body and organ system get much weaker and there may be little that we can do about it. As we hit the middle ages, we start to experience problems such as wrinkles or greying of hair and general fatigue and tiredness after a short amount of activity. However, the real trouble starts when major system dysfunctions, such as the eyes and the vision. Simple things like reading a book or a newspaper may become major tasks and it may be time to realise that we may be suffering from presbyopia. Presbyopia is commonly known as farsightedness and this is a problem in which patients find it difficult to see objects clearly when they are too close to the eyes. It is a common knowledge that the vision system works with the help of natural lenses and its focal point. When the focal point of vision falls on the lenses, you may be able to experience perfect vision, but when it starts to move slightly off the point you may experience problems in viewing regular things such as printed or written words or even the things on your phone or computer. Experiencing blurred vision when you try to view closer objects occurs because the elasticity of the lens of the eyes changes and the focal length of the lens changes with it. However, there are a lot of treatment alternatives for the problem and people do not have to start feeling old just because they experience difficulty in vision. The more conventional treatments for presbyopia include the use of glasses with a power of lens that help in correcting the vision and reading may become a favoured activity again. For those who find the use of glasses to be a hindrance in regular life may also opt for contact lens, which may be a more comfortable alternative for those who may not want to make their problem obvious to the world. In a lot of cases, the people who suffer from the problem of far-sightedness may also choose to undergo surgery for the problem so that it can be corrected completely and no other measures may have to be taken. Health issues may be a regular occurrence as you advance in age and you may have to find alternatives and treatments that help ease out the situation, but it is most imperative to make sure that you take the best advice from a qualified and certified doctor so that you problem may be diagnosed correctly and you may be able to get treatment suggestions that may cater to your specific body and ailment needs. If you wish to discuss about any specific problem, you can consult an Ophthalmologist. How Crossed Eyes Can Be Treated? Vision is one of our most important senses. Reduced vision that triggers the need for corrective glasses is one of the most common disorders associated with the eyes. Crossed eyes are another such common disorder that affects the eyes. In medical terms it is also known as Strabismus. This condition is a result of miscommunication between the brain and the eye muscles that result in misalignment of the eyes. It is largely a hereditary condition and should not be confused with a lazy eye syndrome. Crossed eyes can cause double vision and disorientation. Your depth perception may also be affected. It also causes eye strains and headaches that affect the quality of your life. This condition is seen mostly in children. If not treated in time, it can continue into the adult years as well. The development of crossed eyes in adults who have not suffered from this condition as children is usually a sign of a serious condition such as a stroke. Frequently bumping into things as a result of impaired depth perception. Treatment for this condition can be surgical as well as non surgical. Non surgical treatment aims at strengthening the eye muscles and treating the visual system as a whole. The aim is to not allow the eye to become lazy or amblyopic. Wearing an eye patch over the strong eye and forcing the weak eye to be used is one of the most common form of this treatment. Corrective glasses can also be used to treat this condition in cases where it has been triggered by excessive farsightedness. In some cases, medication may also be injected into the eye to relax the eye muscles. Surgery to correct this disorder involves correcting vision by strengthening or weakening the eye muscles. To do this, a surgeon must first make a small incision in the outer layer of the eyeball to reach the affected muscles. To strengthen the muscle a small section is removed from the muscle and the remaining part is then rejoined. This makes the muscle shorter and forces the eye to turn towards that side. Alternatively, the doctor may make a partial cut across the muscle to elongate it and let the eye turn further away from it. If you wish to discuss about any specific problem, you can consult an Ophthalmologist. Ophthalmology deals with the structure, physiology and diseases of the eye. On the other hand, optometry is a vision care science, which involves the treatment and rectification of the visual system. Specialists emerging from these two schools of medicines are called Ophthalmologists and optometrists respectively. Though, they both deal with the corrective measures and examination of healthy eyes, there are crucial differences between them. Meaning: A specialist in surgical and medical eye problems, who performs operations in the eye is called an Ophthalmologist. On the other hand, an Optometrist is a specialist who has a degree in Doctor of Optometry (OD). He is not a doctor but a trained individual. Area of Specialization: Both these specialists have different areas of specialization. An Ophthalmologist specializes in only vision and eye care. He/she has the necessary training to perform operations on the eye. On the other hand, an Optometrist is not a doctor, but a specialist who is involved in diagnosis, management and treatment of vision changes. He/she has the license to perform eye exams and tests and can prescribe corrective lenses. Training: Both the specialists differ vastly in their training. An Ophthalmologist is trained to treat all eye problems and is equipped to perform operations. He/she undergoes four years of medical school and one year of internship in any hospital. Optometrists on the other hand, after three or more years in college have to undergo four years of training before receiving a doctor of Optometrist. (OD). If you wish to discuss about any specific problem, you can consult an Ophthalmologist. Cataract - How to Reduce Your Risk? We all have only a pair of eyes, so it is imperative that one understands the importance of vision. When the normally clear lens of one’s eye becomes clouded, the condition is known as cataract. A person suffering from cataract finds his vision to be hazy, discoloured and blurred somewhat like looking outside a frosted window. It causes difficulty in reading, driving a vehicle or seeing the familiar expression on a loved one’s face. It is a silent killer of vision and initially magnification and lighting in addition to vision aids are helpful, but eventually a surgery becomes imminent. The exact reason for cataract are debatable, but one can take measures to protect oneself, boost one’s eyes’ defence mechanisms, and protect them from harmful elements. Ultra violet (UV) light has been correlated with incidents of cataract and has a damaging effect on one’s eyes. This requires one to wear sunglasses that block ultraviolet B (UVB) rays when one is outdoors. Smoking also increases the risk of cataract thus giving one another reason to stay away from active as well as passive smoking. One must include antioxidants as zeaxanthin, vitamin C, lutein and vitamin A in daily diet to counteract with the daily damage. The addition of a variety of fruits and vegetables to one’s diet ensures that one is getting many vitamins and nutrients. The health of the eyes can be maintained with fruits and vegetables as they have many antioxidants. One must go for eye examination to ophthalmologists in a time bound and regular manner so to detect the onset of cataract at the earliest. One must maintain a healthy weight by reducing the calorie intake. Excessive consumption of alcohol also increases the risk of cataract. If one is suffering with other health conditions like hypertension and diabetes, it becomes all the more important that one must follow the treatment plan diligently. The exposure to ionizing radiation like X-rays and cancer treatment via chemotherapy increase the risk of cataract. Cataract develops when aging or injury changes the tissue that makes up one’s eye's lens while some cataract are due to inherited genetic disorders causing other health problems. In some cases eye conditions, medical conditions such as diabetes, long term usage of steroids, trauma or past eye surgery also leads to cataracts. As one ages, the eye lenses become less flexible, less transparent and thicker. Ageing causes break down and clumping together of tissues within the eye lens leading to clouding small areas within the lens. As the cataract continues to develop, the clouding becomes denser and involves a greater part of the lens. Thus, although one cannot prevent cataract, but if one takes the above mentioned steps, then he can reduce the risks of getting it. If you wish to discuss about any specific problem, you can consult an Ophthalmologist.